Having seen the disastrous consequences of ‘Gay Pride’ on free speech and civilized society in the United States, other nations with more Orthodox Christians are taking note, and taking action. 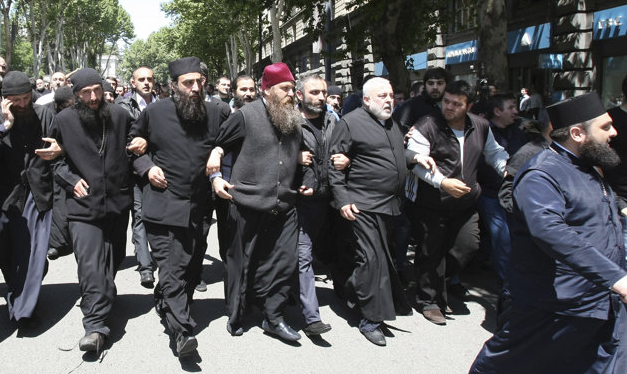 Thousands of anti-gay protesters, including Orthodox priests, occupied a central street in Georgia’s capital Friday, with some threatening to lash with stinging nettles any participant in a gay pride parade which was to take place there. Police, however, failed to prevent scuffles, which resulted in 16 people getting injured, the ambulance service said. A number of protesters carrying bunches of stinging nettles threatened to use them on gay activists. They insist that homosexuality runs against Georgia’s traditional Orthodox Christian values.